Raising a Super Dog - moved to rasuperdog.com: "Baw"
I was wondering why that tennis ball kept getting bigger and bigger*, said Micron. Then it hit me. In A Big Little Life** author Dean Koontz tells a story about his neighborhood walks with Trixie, a golden retriever CCI retiree that he and his wife adopted. Spoiler alert: this book is awesome. Something that which inspires one to awe. The entire, splendid thing. 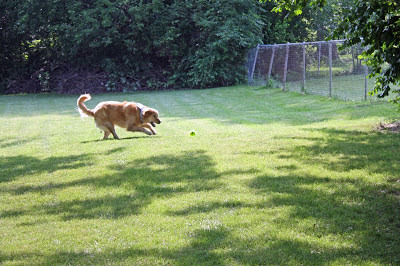 In this particular walking-the-dog tale***, we get an understanding of the deep appreciation Trixie had for tennis balls. After the usual passage of tennis courts along their stroll, one evening Trixie is disappointed to not have found an abandoned tennis ball or two this time. It is her daily joy to discover a fuzzy yellow ball to roll around in her mouth on her way back home. But on this evening, something else is different too. "Looking up at her mom, she opened her mouth and thrust her muzzle forward as though straining to produce a sound -- then spoke." "This sound -- pronounced like the word awe with a b in front, slightly attenuated -- was so unlike anything that came from Trixie before, was delivered with such an earnest expression, and was accompanied by such tension in our girl's entire body . . . Turns out, she realized there was a ball hidden under a bush and she needed permission to go back and get it. She merely hesitated, because Trixie was a good girl and not the kind of dog that *cough micron cough* will forcibly drag their hapless person across three tennis courts to retrieve a high value treat. And so it seemed to Gerda that Trixie's vocalization was an attempt to say exactly and simply what was on her mind. Ok folks, that story, and the golden butterfly one that opens A Big Little Life kinda gives me chills just a little. Whether fact or the fanciful stuff written by a prolific writer of fiction, we Lovers of All Things Dog are well experienced in the magic of the human-canine bond, aren't we? Those of us so fortunate to spend our days with our dogs at our sides find ourselves somewhat bilingual with at least a basic level of Dog Speak. We know to watch body language to determine if that yawn indicates a sleepy dog or a stressed one. Or listen to specific vocalization as a clue to what our furry friend is thinking. While lying around like a shedding carpet, a softly uttered moan indicates the mighty Micron is exhausted, but low groan is passive-aggressive communication that the big guy needs to use the lawn facilities. The latter requires him to actually get up and move, which I suspect is where the groaning comes in. There ain't nobody as skilled in the art of Relaxation as the mighty Micron, you know. Oh, but outside play time is a whole 'nuther animal, so to speak. 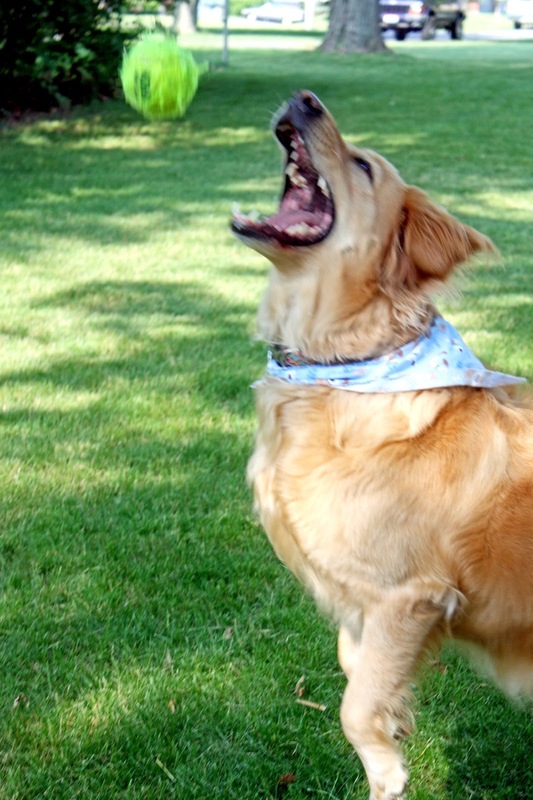 Being a retriever, our Micron is hard-wired in the noggin to carry things about in his maw. Of course, one should never expect this fellow to articulate a "Baw" to express his infatuation of tennis balls. 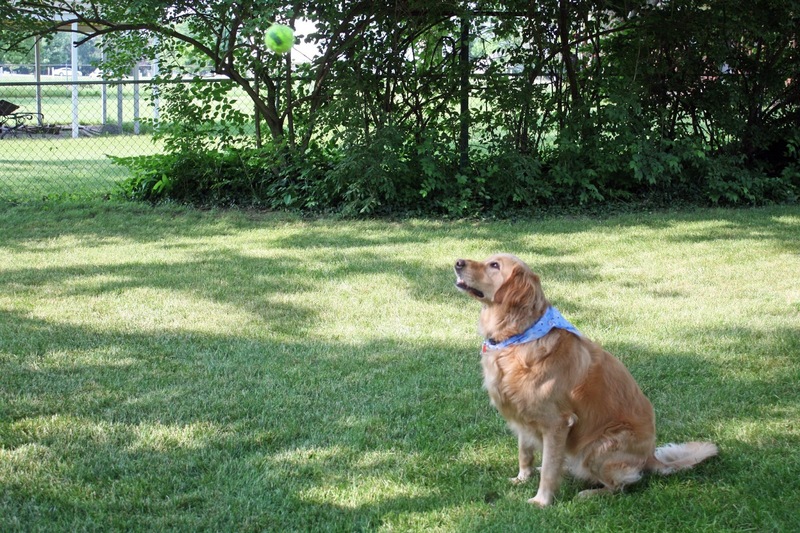 But it is indeed clear when a game of Ball is on his mind. Micron keeps it easy for us. 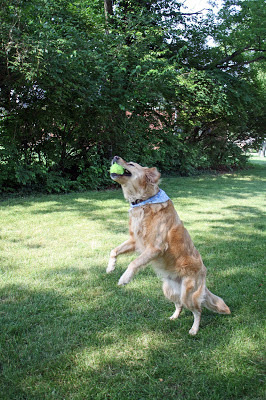 He simply finds one of the dozens of tennis balls strewn about the house like little fuzzy landmines to roll an ankle on -- and brings it to you. With a wide doggy smile and plumed tail waving like a flag, he drops the slightly damp ball upon a lap and takes a step back. His thoughts are radio waves with one simple repeating message: throw the ball throw the ball throw the ball . . . .
And we do. We throw the ball -- over and over. Noting the photo on the right, a ball in the mouth and second one to chase just might cause a short-circuit the canine neurons. This situation, says Micron, blows my mind a little. I love them both so much. Speaking of love, a friend with a new puppy was asking for advice the other day. She has so much energy, says my good friend. And she chews on everything, even the furniture. What should I do? Um, I say. Lookit, we all know I'm merely a Lover of Dog, not some kind of obedience expert. I have no more business giving this kind of advice than I do talking about tax laws. But in the Hippocratic spirit of "First, Do No Harm", I give it a shot. Well, I say. Sounds to me like she's acting just like a normal puppy. Good luck to ya. Ok, I realize that's helpful not at all. So I follow-up with the benefits of crate training, Bitter Apple, and professional obedience classes. But in the meantime, I add, here's what will really help to bond you two. Simple things, really. Always be in the same room when your pup is eating and interact with her. Make sure she knows this wonderful experience comes from you. Give her a lot of positive attention when she's good, especially so during those rare quiet times. And this is really important, I continue. Play with her. Exercise her. It will help her burn some of that destructive puppy energy and she'll eventually link these good times to your presence. It'll take time, but some day this dog will know you as the Best Thing Ever. And it will be her mission in life to please you. She'll want to play ball with you because she sees it makes you happy, too. I'm confident with this bit of advice. I am. 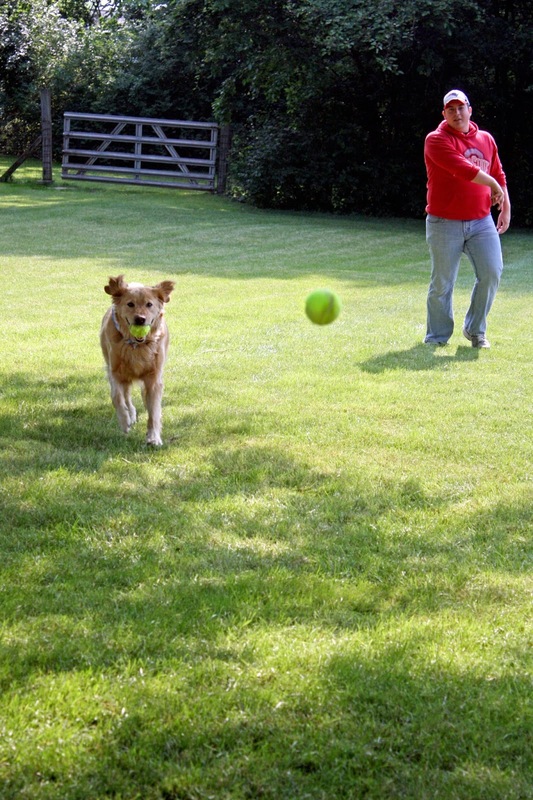 Because it goes both ways, this playtime with my own dog. See, every time that Micron drops a ball into my lap and I look up from my book to meet his smiling, root-beer brown eyes, well . . .
That's the Best Thing Ever, says me. *You see it, right? The tennis ball? Just follow Micron's line of sight to see it hovering there in the top part of the photo. **A Big Little Life, a memoir of a joyful dog named Trixie by Dean Koontz. This tome is a wonderful introduction to Trixie and her life with Dean and Gerda Koontz. And the glorious Trixie has told her own story in such treasures as Bliss to You: Trixie's Guide to a Happy Life and I, Trixie, who is Dog. There's a whole feel-good series of these things. I recommend the lot of them.